What is love? Over centuries, thinkers, philosophers, poets and artists have tried to define the fundamental emotion in various treatises. Some compared it with “a fever” and some called it mysterious and “a temporary insanity curable by marriage”. French writer Marie-Henri Beyle, better-known by his pseudonym Stendhal, in his book On Love, classified love into four types — passionate love, mannered love, physical love and vanity love. But this does not restrict the many ways in which love is felt. The truth is love is indefinable. There is no one word or phrase or taxonomy that can express the real essence. “It’s a gift” that adds vibrancy to insipidity. While some treasure the gift for life, many drift away from it. For the three couples whom Sunday Shillong spoke to, love is defined by “trust” and “togetherness”. The couples, who have cherished the gift for over four decades, have walked through the ups and downs of life together and time failed to change the vibrant love they have had since their youth. The three couples, all residents of Shillong, speak about their journey and what kept them together. “I love you without knowing how, or when, or from where./I love you straightforwardly, without complexities or pride;/so I love you because I know no other way than this” is what they have to say to each other. As the world celebrates Valentine’s Day on Thursday, these love stories are an inspiration for the driftwood generation that is overwhelmed by the outward glitter and misses out on the spirit of love. Nelson Kharkongor and Darity Phanwar (in picture right) who have been married for 43 years, have a divine secret. The duo said they strongly believe in God and that helps them fight all odds. The two families were close and Kharkongor and Phanwar were childhood sweethearts. They got married when Nelson was 27 and Darity 26. “During that time, it was the right age to get married and start a family. From the day we met, we knew we were meant for each other,” said the couple as they smiled at each other. The love reflected in their eyes. One can see the adoration that they have for each other. As young lovers, Kharkongor and Phanwar would converse with each other through letters or on landline phone. “Youths in this generation will not understand how much we had to struggle because cell phones have made life easy for them,” Kharkongor said. They still use the simple mobile phones to stay in touch when one is outside. Kharkongor and Phanwar have five children and two grandchildren. So to have some time together, they wake up early every morning and have their breakfast together. “Love is equivalent to sincerity and trust. These are the pillars which make love stronger. Apart from that, tolerance is the key to keeping a marriage together,” said Phanwar. 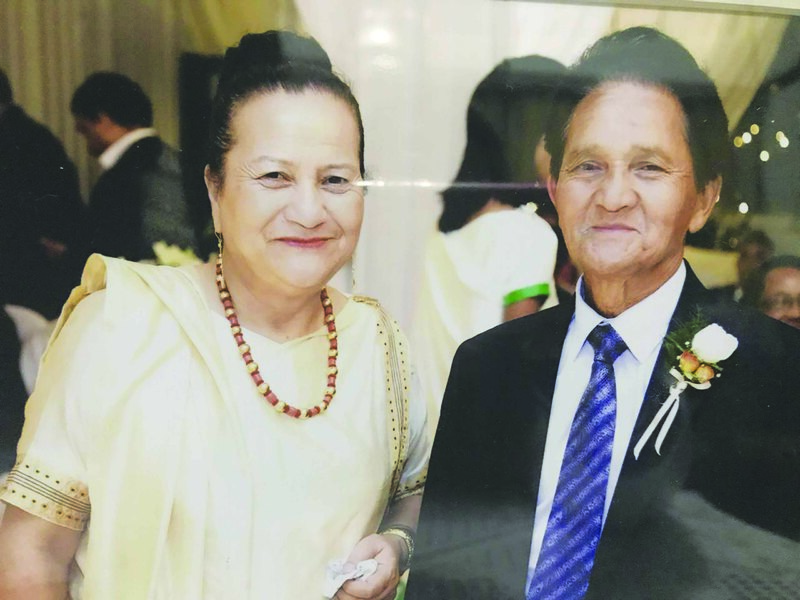 The couple celebrated their 43rd anniversary recently. The family made all arrangements — the daughters baked a cake and dinner was prepared at home. “Seeing this kind of love is rare nowadays. They have really showed me what love is and how to value it,” said their youngest daughter. Home Singh Syiemlieh and Luicy Rynjah met through mutual friends when they were in college. “We never knew that we would fall in love,” said Syiemlieh. Syiemlieh was 27 and Rynjah 26 when they got married 51 years ago. Immediately after, Syiemlieh was transferred to Guwahati and Rynjah followed him. Distance never had an iota of impact on Rynjah’s love. She said she followed the vows which she made on the wedding day. With no quick message service, email or WhatsApp, the only way of communication at that age was the landline phone. “Trust is the most important thing in a marriage,” Rynjah said when asked how difficult it was to be separated. Talking about their young days, the couple said there was less of temerity and dating was not a common practice. As their friendship grew deeper, the bond got stronger and before they could realise, they were in love. “Our love was true from the beginning and we believed that as per the vows that we had taken on our wedding day, we should stay committed to each other,” said Syiemlieh. Both believe that the definition of love takes different forms as “each one of us experiences it in our own way”. “This is why defining love is so complicated,” both said in unison. When asked whether they celebrate Valentine’s Day, the couple laughed and said sheepishly that they were not aware of it. According to Syiemlieh, it is something that people want to follow blindly without knowing the proper meaning of it. “In every relationship, there are ups and downs but if your love is true you conquer through it. A wife is a woman who stands by her husband through all his troubles. And sometimes compromising through situations help them in building their marriage,” Rynjah said. The couple recently celebrated their 51st anniversary. Their daughter and grandchildren organised a surprise party with friends and family. “We were speechless at the arrangement,” they said. Mos War and Shida Blah met when they were in college in 1964. He was studying medicine in Dibrugarh and Blah was a nurse and went there for a three-month training. He was 29 and she was 22 when they got married. For them it was love at first sight. Sitting side by side, telling their story about how they met made them laugh. War’s limited holidays to be at home made them choose February 14, 1967, the day to be united as one. They never knew Valentine’s Day existed and they celebrated it only during their 50th wedding anniversary in 2017. War said Valentine’s Day is a new thing and “most of us never knew about it”. Later, they came to know about it from their children. It was their 50th anniversary in 2017 and their children threw a party where family and friends came together to celebrate their years of togetherness. When War was working in Arunachal Pradesh their only mode of communication was through wireless messages. “We got to make those messages through the Army and that was only when it was an emergency. It took a long time to receive the letters and communication was a daunting task. no misunderstanding between us and both of us were busy bringing up our children,” said War. In the first few years of their marriage, Mos was working in Arunachal Pradesh but later he was transferred to Margherita, Assam. Since it was a family station, Blah joined him with their first born. When asked about how they made their marriage work, the couple said they “took the right path” despite the fact that War, as a doctor, was always busy. So how do they define love? Blah said it is difficult to explain and small things in life matter. Now that they are old, they spend their time together watching TV, reading and “definitely a heater will be there to keep us warm in this cold”, she laughed. love. Ours is old-fashioned and we will always stay that way,” said Blah.